Back in 2010, I lost my job, and was unemployed for longer than I cared to be. During the belt tightening that always happens during times like that, I canceled Cable TV. I wrote about that elsewhere on this blog, so I won’t get into that in this particular post. As time passed, I saw a new service starting, Sling TV. I happily signed up with them almost immediately after they opened. But in 2018 I’m with Youtube TV. Here’s why. First off, I was a Sling TV subscriber since almost Day 1. They were the first (well, I believe the first big player anyway) to market, so I was onboard there. I really wanted to see the return of some cable channels I hadn’t had for years at this point. So I was with Sling for a long time, I was using what is now called Sling Blue. It let me watch Fox Sports Southwest, and see Texas Rangers games, which being in Dallas was a major deal. Because I was a near Day 1 subscriber, I had a grandfathered $20 price point. 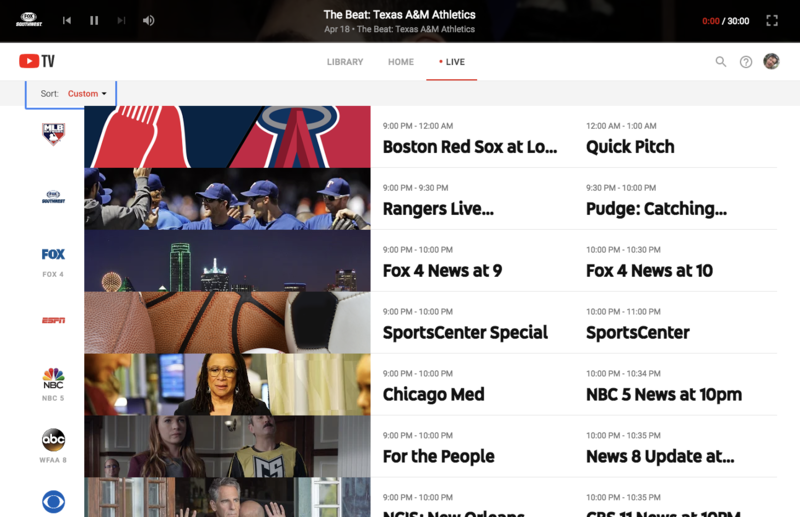 Originally I got the service SOLELY for Texas Rangers games, but then found other channels on there I liked. Went that way for some time, and was pretty happy with it. I even got in on their DVR beta, and as such I had a grandfathered free DVR discount too – so I had a double discount with Sling. However, over time, I grew more irritated, because the one channel I wanted more than any other wasn’t there. That was MLB Network. I kept asking, they kept “putting it on the list”, but nothing ever happened. So I started looking around at other providers. The traditional places were not an option. I cut cable in 2010 when I was unemployed, I was NOT going back. That ruled out people like DirecTV, Dish, or Cable TV. mlb.tv wasn’t an option for two reasons. OK, so I started looking elsewhere. I briefly looked at Playstation Vue, but canceled before my free trial ran out. The primary reason for that was price. To get all the channels I wanted, I needed their $55 a month plan. Bye. Too much. Somewhere around this time, I tried out DirecTV NOW, as they were just launching. They had a program where you could get their $60 a month package for $35 a month if you signed up with them at launch. I did that. They had MLB Network, so I was happy there. However, the inability to time shift anything (they had no DVR at that point) made them really not useful. I’ve been a TiVo customer since 2000, and forcing me to watch things when they’re ACTUALLY on are a problem. So no, they got cancelled. Back to Sling TV. Somewhere around here I tried Hulu Plus (in beta). They were OK, but they didn’t offer anything compelling to get me to switch to them, so the trial was it with them. Plus they had one major problem – the same one that Sling had. No MLB Network. If you have no MLB Network, then forget it. Not going there. I’ve lost track of the timeframe here, but we’re into 2018, and earlier in the year I successfully lobbied DirecTV to give me back the $35 grandfathered price point even though I canceled their service and gave up that price. They did, and then I was back on DirecTV NOW again with the great $35 price. The reason I did this is because they had a DVR service in beta finally. For the first month, I didn’t have access to that, but I did get access after a month. I was so looking forward to this, as they had MLB Network, plus they were adding a DVR. I was excited. Great package – great price, with the #1 channel I wanted plus a DVR. Except they totally and utterly screwed the pooch. Their DVR is a mess. It’s total crap. I was shocked at how bad it was. Now I get it was beta, and things improve, but it didn’t improve at ALL during the time I spent with it (about three months). I won’t get into the specific technical details, but the one most heinous problem is the fact that the skim through DVR feature that any DVR has was broken. You’d slide forward to a point in a recording, and it would push you back to the start. Basically you could record stuff, but you had to watch it all in one go without any kind of fast forward or anything. Oh my god. This was SO bad – I mean *SO AWFUL* that I knew I wouldn’t stay. I hoped though – I kept the account going for a bit on the hopes they’d improve their DVR, but I wasn’t expecting anything. I kept looking. Came to Youtube TV. Now I wasn’t sure why I didn’t try them sooner, but they were the last of the major players I hadn’t tried. Should have tried them first. Basically, I ended up loving Youtube TV so much, I went and canceled both Sling TV & DirecTV NOW, which I was still hanging onto. I hated giving up my double grandfathered price with Sling, but Youtube TV was so far superior in every respect, I had no problem with that. Here’s the bullet points as to why I like this. They have all the channels I want. MLB Network of course, but also has ESPN, as well as Fox Sports Southwest (with no local sports blackouts) and TBS. There’s a bunch others I wanted, but these are the primary ones. Between all of those, you’re pretty much covered for all baseball. The DVR has no limits. The other providers that have DVR’s have some sort of limit for hours you can record, and then uncharge you for more hours. Not here. You can theoretically record every program on every channel (all at once no less) and it won’t have a problem. They do have a time limit, though – they will remove recordings you make nine months later. But in terms of “You can only record 100 hours”.. No. It’s unlimited. Multiple Accounts – You can have what they call “Family Sharing”. You can define six people to be in your family and each of them will have their own DVR recordings, their own libraries. It’s a great way to combat the concept of “Hey, I wanted to record that”. They do check locations of people using it, you can’t just add friends on the other side of the country – its designed to be used within the same household. I’ve read where people in the same town can get away with it, but I’ve not put this to the test. You can have three streams going at once. That is not likely to be a problem for most people. 60fps on Sports channels. This is a bigger deal than most people think. Their sports channels have 60fps vs 30fps on some. This makes a big deal when watching sports, it looks more clear. Rock solid streaming – In all the time I’ve had Youtube TV, I’ve had no problems with streaming and buffering. I have with others. You expect some when dealing with streaming, but this has been awesome on all the platforms I’ve used it on (iOS, PC Browser, Xbox One, & Apple TV). Given it’s based on underlying Youtube technology from Google, that shouldn’t really be a surprise. The interface is quite nice. I like the font choices. I realize this is a really personal thing, what I like isn’t likely to be liked by others. But it’s a big intangible for me as to why I love it. 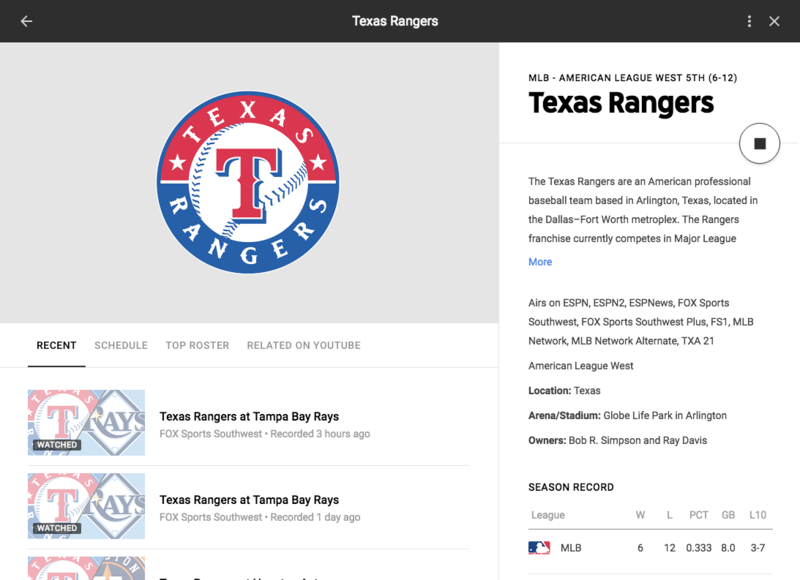 You can follow sports teams – you tell it you want to follow say the Texas Rangers and it records everything across all channels. You also get additional info about the team too. Here’s a screen grab of the “Texas Rangers” page from my installation. One other thing about sports – you can tell the service to not tell you the scores of games, so they won’t be spoiled on you. That’s a nice thing. Their DVR does work a little differently than others. It took some getting used to, but now that I’m onboard, I really like this. With most other DVR’s (either streaming or physical like a TiVo) you record a show, and you have conditions like “New only” or “repeats”. Not here. You add a show to your library, and it records EVERYTHING. All episodes, all repeats, everything. You can do stuff like that when there’s no limits on the DVR. Given you can record “everything”, it’s an interesting way to build up collections for binging. 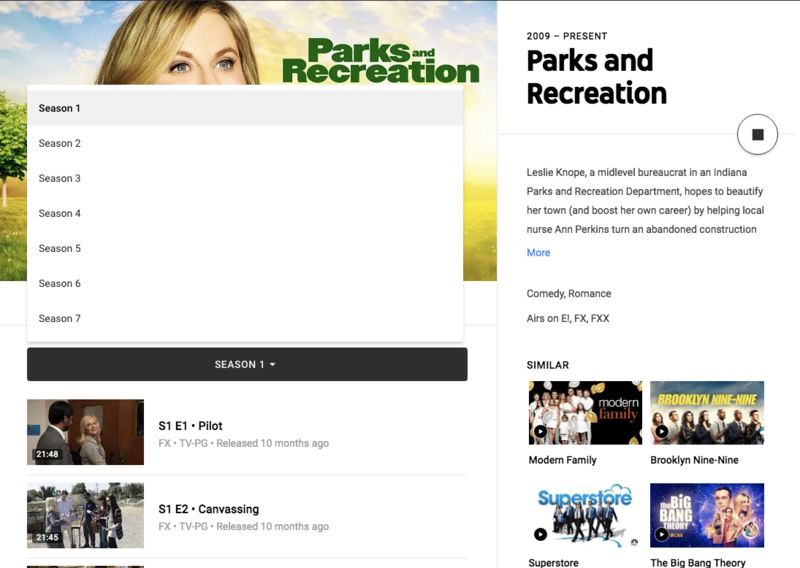 I’ve been meaning to watch Parks & Recreation – I added it here, and within a month, it had recorded well over half of the episodes of that show. That’s pretty cool. The Live TV view has some nice graphics for shows that are well, “live”. All of these things combined together are why I have a thing for Youtube TV. In fact, I’ve started watching more things on this than I have on TiVo, and I’ve been a TiVo customer since 2000. That’s also got to do with TiVo’s new 2018 interface, which I’m NOT a fan of. But I digress. As great as they are, there’s still a few nits I want to see improved. The future guide info only goes out about 24 hours. Now the system knows about more than that, but they only show you about 24 hrs into the future. It makes for odd things like if you’re watching a show, and they say “next Thursday at 8PM watch ‘so and so'”.. You can’t just go record that. I’ve had to send notifications to myself to remind me to do that. 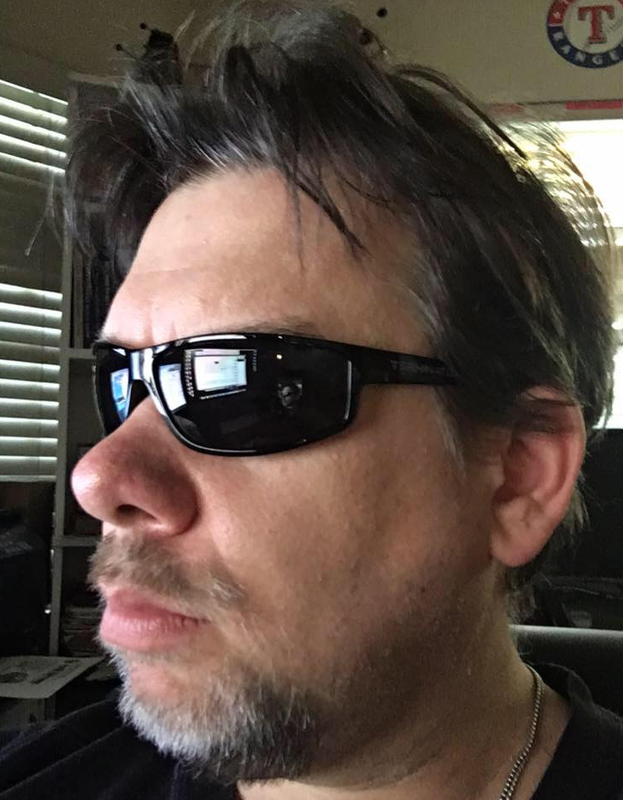 More browser support. Until VERY recently, you had to use Chrome. They recently added Firefox support, but I want to see them go beyond that, as Safari on macOS is my daily driver. I’d rather not have to fire up a separate browser just for this if I don’t have to. No CW Network, which means no Arrowverse stuff. They do have it as VOD, but local channels that carry CW are not available. Those are the only flaws in the system I’ve run into. As for their channels..
Their channel listing is shown below, and they have a much more fiddly listing of channels here. Now they don’t have all the popular channels yet. Specifically Scripps network channels (including Food Network, HGTV, Travel Channel) and Viacom (MTV/VH1, Nickelodeon, BET, Comedy Central). There’s some talk that the Scripps channels will get added this year. No word on Viacom that I’m aware of. The service does come with access to the Youtube Red content that is on regular Youtube, but you don’t get the ability to skip ads on regular Youtube with this that you do with a Youtube Red subscription. I was hoping, but no. 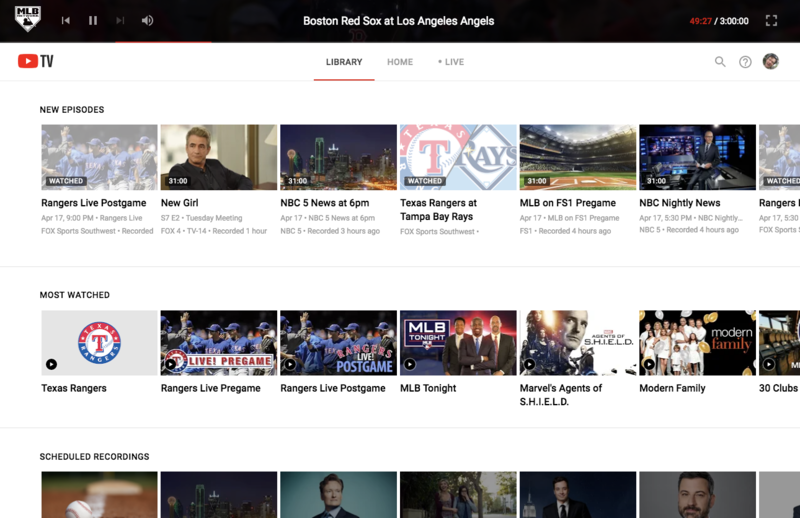 While I mostly use Youtube TV on a computer with a browser, or my Apple TV, I also have used it on my Xbox One, as well as my iPad. A full list of supported devices is available on their site here. 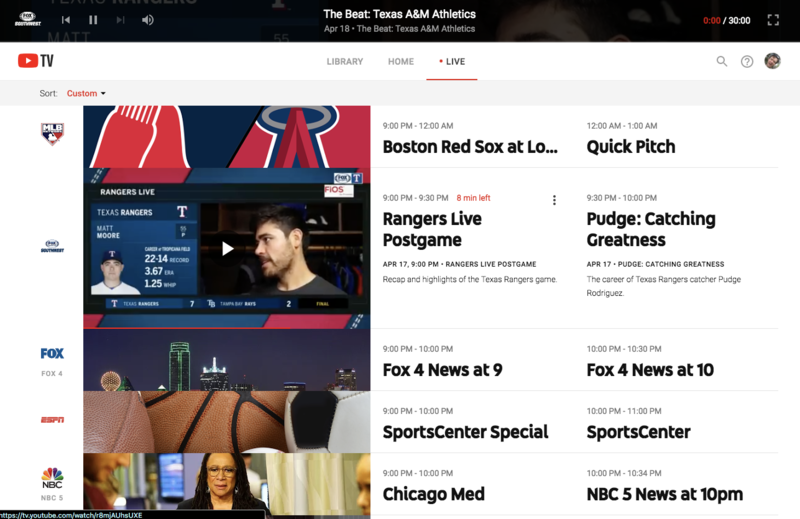 Ultimately, channel choice will drive the choice of service here, and for me, that’s truly MLB Network and Fox Sports Southwest. Couple that with the superior DVR interface, and it’s game over for me. Youtube TV is is for me. 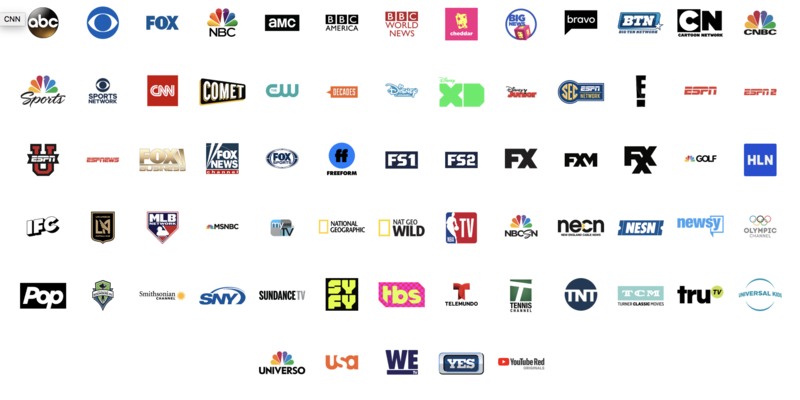 Now I know there’s a few others in this market now (FuboTV being one), and T-Mobile recently bought Layer 3, and will be having their own streaming service later. But I can’t imagine a combination of service that will beat this for me, so I’m all in on Youtube TV. They have a free trial, which is only a week, but still. Check it out. You might like it. I LOVED it. I’ve been doing a lot of cord cutting research lately. Currently using DTV Now, but I also am frustrated with their DVR. I hope it gets better before it’s out of BETA. Thanks for the hands-on review of Youtube TV. I’ll be keeping my eye on their channel line-up. No HGTV is a deal breaker for my wife. We’ve also been using a Tablo device with an OTA antenna. Hook your antenna to it, hook it to the router. Apps for all your streaming devices and phones, and you can also stream to a browser. You can stream live OTA TV or recorded stuff. We like it, though it still has a few rough edges. I recommend it.